Did you know that after a food is harvested its nutrient value immediately begins to deplete? That’s just one of the reasons why eating locally sourced food is so important. 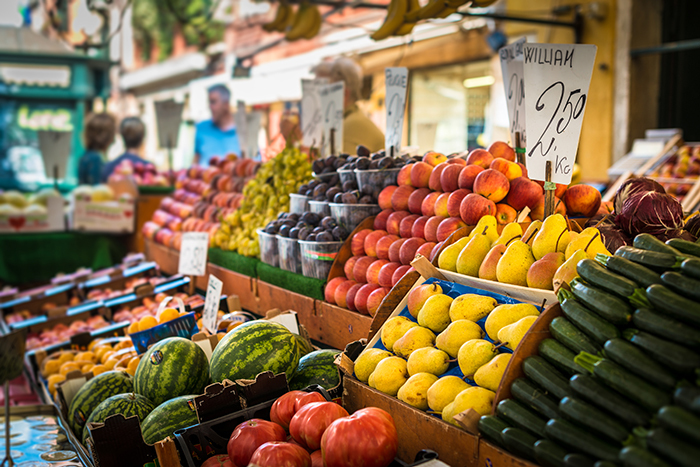 Here in the Pacific Northwest we have an abundance of fruits and vegetables that grow seasonally and are available at local farmers markets. Some may call me a produce nerd, but one of my favorite things to do when I visit a new city is check out their farmers market to see what’s hoppin’ in their fruit and vegetable scene. Here are just a few of the benefits of eating locally sourced foods. When food is sourced locally there is a shorter lag time between when the food is harvested and when we eat it. This is important because once a plant is harvested, its nutrients start to slowly deplete. After two to four days the nutritional value of a food is depleted substantially. Eating an apple off of a tree will render more nutrients than buying an apple in the store. Shorter lag time between harvest and table also means tastier food. Not only will the food have more nutrients, but the taste will be fresh and more satisfying. When we eat locally, we are also eating seasonally. Eating seasonally means that we are taking in foods that are meant to be eaten during that time of year. Believe it or not, our bodies require different nutrients during different seasons. Foods like melon and cucumber can be cooling during the hot summer months, while root vegetables like potatoes and turnips are warming for the colder winter months. Food grown in a specific region will have the nutrients needed to thrive in that environment. When we eat food that is grown in our local environment we are nourishing our bodies to survive in the environment we are living in. Bananas, for instance, are grown in tropical regions where there is a lot of sunlight – a natural source of Vitamin D. One little known fact about bananas is that they can actually deplete our Vitamin D supply. This is a useful mechanism for people that are getting constant sun exposure. However, for people living in areas with less sunlight the banana could be working against them. Locally sourced food is just that, local. It doesn’t have to travel far to get to your table, meaning there are less emissions produced from transporting your food. People with allergies often benefit from ingesting locally sourced honey. Because the bees are exposed to indigenous pollens, ingesting the honey for a few months before allergy season can actually build up your immunity to local allergens. All fruits and vegetables are important for our health, and I agree with you Jennifer, every region from this world has own locally and seasonally products. This kind of natural foods helps any diet, for healthy persons and even more, for diabetics.